EM-Tec F18 is a high capacity FIB grid holding stub for holding up to 8 FIB grids with 4 individual small clamps. It is basically 4 x the EM-Tec F12 on a 25.4mm (1”) stub. 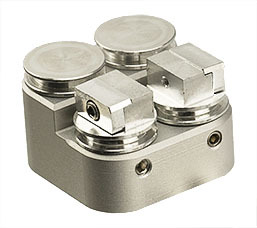 Each of the 10mm wide vise clamps includes a ledge for easy positioning of the FIB grids. Ideal for safe storage of the FIB grids with lamellas or for high throughput FIB applications. EM-Tec F25 is a larger FIB grid holder which can accommodate up to 5 FIB grids of the same thickness. The 25mm wide vise includes a ledge for easy positioning of the FIB grids and two brass thumb screws to operate the vise. Available with pin stub and M4 threaded hole. EM-Tec FS21 combines the EM-Tec F12 FIB grid holder with two standard 12.7mm (1/2”) pin stubs. The F12 FIB grid holder and the sample stubs can be rotated in the holder for selecting the optimum orientation in the FIB/SEM system. The EM-Tec FS21 FIB grid and sample holder enables loading the samples and FIB grids close together. The FIB grid and the sample stubs are at the same level when using Si wafer samples. Available with pin stub and M4 threaded hole. 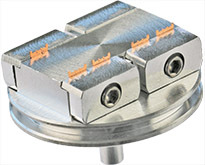 EM-Tec FS22 combines two F12 FIB grid holders with two standard 12.7mm (1/1”) pin stubs within a 27x27mm footprint. Both the F12 FIB grid holders and the pin stubs can be rotated independently in the holder for selecting the optimum orientation in the FIB/SEM system. The EM-Tec FS22 dual FIB grid and sample holder enables loading the samples and FIB grids close together. The FIB grid and the sample stubs are at the same level when using Si wafer samples. Available with pin stub and M4 threaded hole. EM-Tec FS25 combines the wider FIB grid holder vise with a holder for samples on the Ø25.4mm pin stubs in a single compact holder. This provides a single loading cycle for FIB grids and samples and short distances from lift-out to lamellae mounting. Wafer type sample surface is at the same height as the FIB grid posts. Available with pin stub and M4 threaded hole. 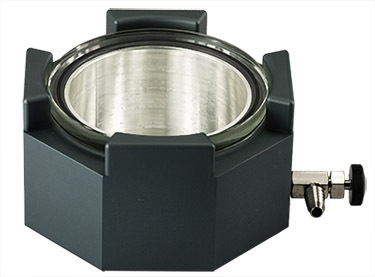 These holders can all be used on th FIB and FIB/SEM systems from FEI, Hitachi, Zeiss and Tescan.For JEOL FIB/SEM systems use a suitable EM-Tec stub adapter. EM-Tec F25 is a wider FIB grid holder with pin which can accommodate up to 5 FIB grids of the same thickness. 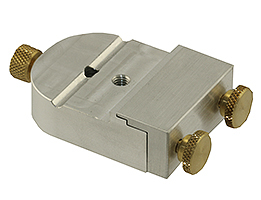 The 25 mm wide vise include a ledge for easy positioning of the FIB grids and two brass thumb screws to operate the vise. EM-Tec FS21 combines the EM-Tec F12Z FIB grid holder with two standard 12.7mm (1/2inch) pin stubs. The F12 FIB grid holder and the sample stubs can be rotated in the holder for selecting the optimum orientation in the FIB/SEM system. The EM-Tec FS21 FIB grid and sample holder enables loading the samples and FIB grids close together. The FIB grid and the sample stubs are at the same level when using Si wafer samples. Includes 1x EM-Tec F12Z and 2x standard 12.7mm pin stubs. EM-Tec FS22 combines two F12 FIB grid holders with two standard 12.7mm (1/2inch) pin stubs within a 27x27mm footprint. Both the F12 FIB grid holders and the pin stubs can be rotated independently in the holder for selecting the optimum orientation in the FIB/SEM system. The EM-Tec FS22 dual FIB grid and sample holder enables loading the samples and FIB grids close together. The FIB grid and the sample stubs are at thesame level when using Si wafer samples. Includes 2x EM-Tec F12 and 2x standard 12.7mm pin stubs. The EM-Tec FS25 combines the wider F25 FIB grid holder vise with a holder for Ø25.4mm pin stubs in a single compact holder with a standard pin. This provides a single loading cycle for FIB grids and samples and short distances from form lift-out to lamellae mounting. Wafer type sample surface is at the same height as the FIB grid posts. EM-Tec F25 is a wider FIB grid holder with a M4 threaded hole which can accommodate up to 5 FIB grids of the same thickness. 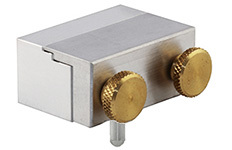 The 25mm wide vise include a ledge for easy positioning of the FIB grids and two brass thumb screws to operate the vise. EM-Tec FS21 combines the EM-Tec F12 FIB grid holder with two standard 12.7mm (1/2inch) pin stubs. 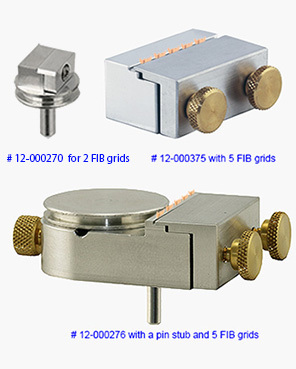 The F12 FIB grid holder and the sample stubs can be rotated in the holder for selecting the optimum orientation in the FIB/SEM system. The EM-Tec FS21 FIB grid and sample holder enables loading the samples and FIB grids close together. The FIB grid and the sample stubs are at the same level when using Si wafer samples. Includes 1x EM-Tec F12Z and 2x standard 12.7mm pin stubs. EM-Tec FS22 combines two F12 FIB grid holders with two standard 12.7mm (1/2inch) pin stubs within a 27x27mm footprint. Both the F12 FIB grid holders and the pin stubs can be rotated independently in the holder for selecting the optimum orientation in the FIB/SEM system. The EM-Tec FS22 dual FIB grid and sample holder enables loading the samples and FIB grids close together. The FIB grid and the sample stubs are at the same level when using Si wafer samples. Includes 2x EM-Tec F12 and 2x standard 12.7mm pin stubs. The EM-Tec FS25 combines the the wider F25 FIB grid holder vise with a holder for Ø25.4mm pin stubs in a single compact holder with an M4 thread. This provides a single loading cycle for FIB grids and samples and short distances from form lift-out to lamellae mounting. Wafer type sample surface is at the same height as the FIB grid posts. *Nettopreise zuzüglich gesetzlicher Umsatzsteuer. Wir verkaufen nicht an Privatpersonen. EM-Tec F12Z is a basic yet practical FIB grid holder with pin for 2 FIB grids. 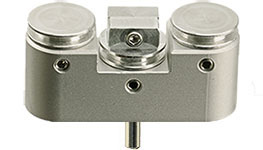 Based on the standard Ø12.7mm pin stub with the short Zeiss pin, it is compact and useful for storing valuable FIB samples. 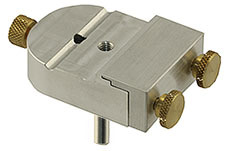 The 10mm wide vise clamp includes a ledge for easy positioning of the FIB grids.